Purpose: To examine the association of cognitive function, age, and hearing loss with clinically assessed hearing aid benefit in older hearing-impaired persons. Methods: Hearing aid benefit was assessed using objective measures regarding speech recognition in quiet and noisy environments as well as a subjective measure reflecting everyday situations captured using a standardized questionnaire. A broad range of general cognitive functions such as attention, memory, and intelligence were determined using different neuropsychological tests. Linear regression analyses were conducted with the outcome of the neuropsychological tests as well as age and hearing loss as independent variables and the benefit measures as dependent variables. Thirty experienced older hearing aid users with typical age-related hearing impairment participated. Results: Most of the benefit measures revealed that the participants obtained significant improvement with their hearing aids. Regression models showed a significant relationship between a fluid intelligence measure and objective hearing aid benefit. When individual hearing thresholds were considered as an additional independent variable, hearing loss was the only significant contributor to the benefit models. Lower cognitive capacity – as determined by the fluid intelligence measure – was significantly associated with greater hearing loss. Subjective benefit could not be predicted by any of the variables considered. Conclusion: The present study does not give evidence that hearing aid benefit is critically associated with cognitive function in experienced hearing aid users. However, it was found that lower fluid intelligence scores were related to higher hearing thresholds. Since greater hearing loss was associated with a greater objective benefit, these results strongly support the advice of using hearing aids regardless of age and cognitive function to counter hearing loss and the adverse effects of age-related hearing impairment. Still, individual cognitive capacity might be relevant for hearing aid benefit during an initial phase of hearing aid provision if acclimatization has not yet taken place. Hearing loss is among the most prevalent chronic disabilities in older adults. It is estimated that about two-thirds of persons aged 70 years or older exhibit hearing problems.1,2 Age-related hearing loss is typically of the sensorineural type. The common way to counter sensorineural hearing loss is amplification by hearing aids (HAs). The basic function of HAs is acoustic amplification of the sound signal. Amplification aims to restore the audibility of sounds, and thus helps to improve speech perception – the main objective of HA provision. However, modern HAs contain numerous advanced signal processing features, such as dynamic range compression, in order to address changes in loudness perception associated with hearing loss or noise reduction schemes that alleviate speech understanding against background noise. In addition to the pure amplification of sounds, these features provide many HA users with an additional benefit. On the other hand, advanced signal processing may introduce artifacts in the sound signal that potentially counteract to the beneficial function. A number of recently published studies have highlighted a possible interaction of amplification and cognitive function of the users. A common line of argumentation is that persons with lower cognitive capacity benefit less from certain signal processing algorithms since they are more susceptible to the artifacts associated with some advanced processing schemes. For instance, Gatehouse et al,15 Lunner and Sundewall-Thorén,16 and Foo et al17 have found that HA users with higher cognitive performance (ie, working memory [WM] capacity) performed better with fast dynamic compression than individuals with lower cognitive skills. The latter showed better speech intelligibility with slow compression. Ng et al18 found that noise reduction algorithms had a positive effect on word recall in individuals with good WM capacity, whereas there was no such effect for participants with poor WM capacity. With regard to frequency compression, Arehart et al19 showed that listeners with higher WM capacity revealed better intelligibility of strongly frequency-compressed speech than those with low WM. However, such findings have not been observed universally. Cox and Xu20 found that persons with lower cognitive abilities might also benefit from fast compression – at least with contextual speech. When speech is low in semantic context, listeners with lower cognitive abilities might benefit more from slower compression. Neher et al21 investigated performance with noise reduction schemes and cognitive function, but did not find any significant interaction. Contrary to common understanding, they found that individuals with a lower WM capacity preferred stronger noise reduction settings, and thus accepted more artifacts and higher degradation of the speech signal in favor of more noise reduction. Though the results of these studies are not conclusive, it might be presumed that the user’s cognitive function has an impact on the effectiveness of the intervention with HAs. Kalluri and Humes11 assumed that, when considering two older adults with similar hearing loss and similar HAs, it might be expected that the one with superior cognitive capacity might reveal a better HA outcome. This is in line with clinical observations showing that some older HA users receive less benefit from HAs than expected from their hearing status alone. The present study addresses the question of whether different general cognitive skills potentially associated with speech perception have an impact on the effectiveness of amplification with HAs assessed under typical clinical conditions. Concretely, objective and subjective measures of HA benefit were determined and related to the outcome of neuropsychological testing addressing various cognitive functions, such as memory, attention, and fluid intelligence, as well as to the auditory status (ie, hearing threshold) of the individual. Based on the studies described above, it is hypothesized that hearing-impaired individuals with poorer cognitive skills receive less benefit from HAs than those with stronger cognitive skills. Identifying cognitive functions associated with HA benefit might help to provide more individualized approaches to HA provision in older adults. Thirty persons with sensorineural hearing loss using modern hearing instruments from a variety of manufacturers (Audio Service, Oticon, Phonak, Resound, Siemens, Starkey, Widex) were enrolled in the study. As the major processing scheme, the hearing instruments typically provided wide dynamic range compression with variable compression time constants. Criteria for inclusion were typical symmetrical mild-to-moderate hearing loss, an age of 50 years or older, HA experience of 6 months or more, bilateral HA use on a regular daily basis, no serious restrictions of general health conditions, and no diagnosed dementia. Fourteen participants were female; 16 were male. The mean age was 71.4±7.3 years. The auditory and cognitive status of the participants was assessed using pure-tone audiometry and a cognitive screening instrument (‘DemTect’).22,23 Mean unaided thresholds of the better ear at pure tone frequencies of 0.25, 0.5, 1, 2, 4, and 8 kHz were 20, 26, 37, 50, 62, and 68 decibels hearing level (dB HL), respectively. Mean hearing loss of the better ear calculated as the mean across audiometric frequencies from 500 Hz to 4 kHz (better ear hearing loss [BEHL]), was 43±8.6 dB HL, thus covering the range of mild to moderate hearing loss (classification according to the American Speech-Language-Hearing Association [ASHA]). The DemTect revealed that 25 participants were within the normal range (score 13–18 points) and suggested MCI in five participants (score 9–12 points). All subjects gave written informed consent for their participation. The study protocol was approved by the institutional ethics committees (Universities of Cologne and Giessen). Speech recognition with and without HAs was determined under quiet conditions and against background noise using standard clinical protocols. Speech recognition in quiet conditions was administered using an open-set phonemically balanced word test (Freiburg Monosyllable Test).24 Twenty monosyllabic words were presented via free field loudspeaker at 65 dB sound pressure level (SPL) placed approximately 1.2 m in front of the participant’s head. The percentage of correct answers was determined. Speech recognition in a noisy environment was administered using the Oldenburg Sentence Test (OLSA).25 Twenty matrix sentences (structure: name-verb-numeral-adjective-object) were presented against a noise background via free field loudspeaker at 65 dB SPL placed approximately 1.2 m in front of the participant’s head. The signal-to-noise ratio (SNR) was adaptively adjusted in order to determine a predefined percentage of correct word recognition.26 Since studies have shown that the outcome with HAs as well as the association with cognitive abilities might differ for various noise types,15,16 two different background noise signals were used in this context: a speech-shaped steady-state noise (‘olnoise’) composed by superposition of all sentences of the OLSA corpus and a speech-shaped noise with amplitude fluctuations (‘ICRA5_250’,27 maximum pause duration of 250 milliseconds) mimicking the envelope of fluent speech. Furthermore, it has been suggested that there might be an interaction between cognitive abilities, noise type, and level of performance.28 Thus, two different performance levels – 50% correct word recognition (L50) and 80% correct word recognition (L80) – were determined. Hence, four different background noise conditions (steady-state noise L50, steady-state noise L80, fluctuating noise L50, fluctuating noise L80) were administered in the present study. Following the typical clinical procedure, the benefit derived from the HAs was defined as the improvement of the aided condition compared to the unaided condition. Thus, the benefit was calculated as the difference between the outcome of the aided and the unaided measurements. For subjective assessment of HA outcome, the International Hearing Aid Outcome Inventory29 (IOI-HA) was used. The IOI-HA presents seven questions addressing the amount of HA use (item 1), benefit (item 2), residual activity limitation (item 3), satisfaction (item 4), residual participation restriction (item 5), impact on others (item 6), and change of quality of life (item 7). All questions are answered on a five-point Likert scale coded 1–5, with higher values reflecting better HA outcome. An overall score can be derived by averaging the scores of all items from the IOI-HA. The Mehrfachwahl-Wortschatz-Intelligenztest, part B (MWT-B)30 assesses crystallized intelligence. The MWT-B presents 37 lists of five words, of which four are nonsense items. The true word has to be detected. Lists with increasing difficulty are presented. The number of correctly identified words is taken as the outcome measure. The Leistungsprüfungssystem subtest 4 (LPS-4)31 tests logical reasoning – an ability tightly linked to fluid intelligence. Items disturbing logical patterns in 40 series of numbers and letters have to be identified within a time period of 8 minutes. Series are presented with increasing difficulty. The number of correctly noted items is counted. The Verbaler Lern- und Merkfähigkeitstest (VLMT)32 was used to test verbal short-term memory. In this test, a list of 15 words is presented and the task is to recall as many words as possible directly after presentation. This procedure is repeated five times, typically yielding an increasing number of memorized words. The sum of correctly recalled words is taken to indicate short-term memory capacity. The sentence span (SS) test33 assesses WM capacity. It is a variant of the reading span test originally designed by Daneman and Carpenter in 1980.34 A balanced number of meaningful and nonsensical sentences are presented. The task of the participant is to judge if the sentence is meaningful or not. After judgment, a letter is presented for the duration of 1 second. After a series of four to eight sentences, the task is to recall the letters in the order of their presentation. The outcome measure is the percentage of correctly recalled letters. The Aufmerksamkeits-Belastungs-Test (test d2-R)35 measures selective attention and the maintenance of alertness. In 14 random sequences of printed ‘d’s and ‘p’s presented with zero to four dashes, participants are asked to mark all ‘d’s with two dashes within a span of 20 seconds per sequence. The numbers of processed items minus the number of omissions and false alarms is taken as the outcome measure. The Zahlen-Verbindungs-Test (ZVT)36 assesses cognitive processing speed. Graphically scattered consecutive numbers have to be connected by lines in an ascending order. The completion time is measured as the outcome. To detect the relationship between HA benefit and cognitive abilities, stepwise multiple linear regressions were calculated with the different HA outcome measures as dependent variables and the outcome of the neuropsychological tests as independent variables. The age of the participant and individual hearing loss were additionally considered as possible explanatory variables for HA benefit. Prior to regression modeling, assumption testing was conducted to check for normality, linearity and additivity, independence of errors, and homoscedasticity. The Kolmogorov–Smirnov test revealed that data of the benefit measures for speech in a quiet environment and speech in steady-state noise as well as the overall IOI-HA score were not normally distributed. In these cases, log transformations were conducted in order to account for the skewness of the data. After transformation, no serious violations with regard to assumption testing were noted. All statistical analyses were conducted using SPSS (v21; IBM Corporation, Armonk, NY, USA). The P-value was always set to 0.05. Table 1 shows the benefit measures (ie, the difference between aided and unaided conditions) for speech in a quiet environment, speech in steady-state noise, and speech in fluctuating noise. All measures showed a benefit significantly greater than zero (Wilcoxon signed-rank test, P<0.05), except for the speech in steady-state noise at an 80% performance level, which showed a tendency toward significance (Wilcoxon signed rank test, P=0.068). When looking at the conditions with the noise maskers, it appeared that the benefit for fluctuating noise was significantly greater than for steady-state noise for both performance levels (Wilcoxon matched pairs, P<0.001), but that the values for the performance levels of 50% and 80% did not significantly differ for each noise signal (P>0.05). Notes: Means, standard deviations, and percentiles are given. L50, 50% speech recognition; L80, 80% speech recognition. Subjective assessment of HA outcome determined by the IOI-HA is shown in Table 2. The score of the 50th percentile corresponded to the following wording of the IOI-HA: ‘HA usage more than 8 hours a day’ (item 1), ‘HAs helped quite a lot’ (item 2), ‘moderate difficulty remaining with HAs’ (item 3), ‘HAs are quite a lot worth the trouble’ (item 4), ‘with HAs, hearing difficulties did not at all affect things one can do’ (item 5), ‘with HAs, hearing difficulties did not bother other people at all’ (item 6), and ‘enjoyment of life is quite a lot better with HAs’ (item 7). Notes: Means, standard deviations, and percentiles are given. 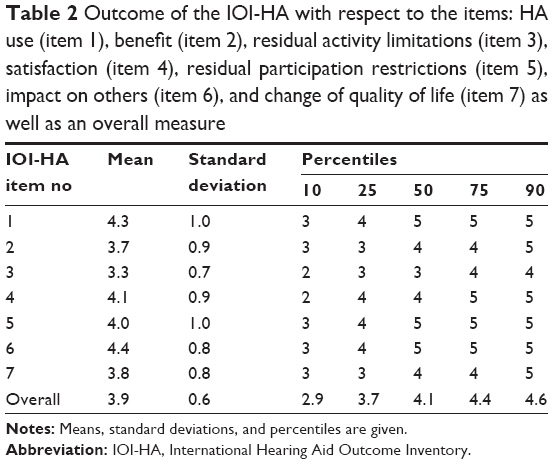 Abbreviation: IOI-HA, International Hearing Aid Outcome Inventory. 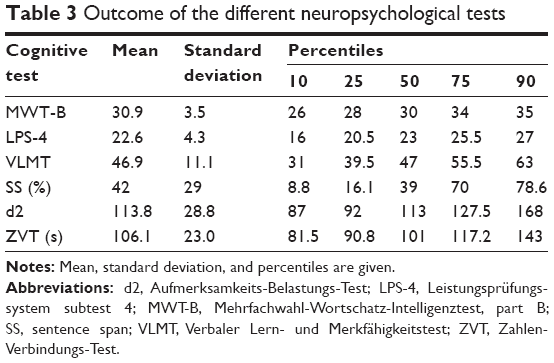 Table 3 shows the outcome from the different neuropsychological tests administered in this study. All tests showed substantial interindividual variation. On average, about 31 words were correctly identified with the MWT-B (crystallized intelligence) and 23 items were correctly identified with the LPS-4 (fluid intelligence). Average recall was 47 words with the VLMT (short term memory) and 42% with the SS task (WM). On average, the test d2 (selective attention) revealed 114 correctly identified items and mean completion time for the ZVT (cognitive processing speed) was about 106 seconds. Notes: Mean, standard deviation, and percentiles are given. Abbreviations: d2, Aufmerksamkeits-Belastungs-Test; LPS-4, Leistungsprüfungssystem subtest 4; MWT-B, Mehrfachwahl-Wortschatz-Intelligenztest, part B; SS, sentence span; VLMT, Verbaler Lern- und Merkfähigkeitstest; ZVT, Zahlen-Verbindungs-Test. Data were subjected to different linear regression models with the benefit measures as dependent variables and cognitive function, age, and hearing loss as independent variables. Since the outcome for the noise maskers did not differ significantly in terms of performance level (L50, L80) and the measures for 50% and 80% speech intelligibility showed very similar relationships with the independent variables, the two performance levels were collapsed to a single measure for each noise masker by calculating the mean of both values. Thus, with respect to the objective benefit determined by speech testing, three different outcome measures (speech in a quiet environment, speech in steady-state noise, and speech in fluctuating noise) emerged. Two different models were calculated; Model I with the outcome of the neuropsychological tests and age as predictor variables and Model II, which additionally considered unaided BEHL as a predictor variable. The outcome of the models is shown in Figure 1. Figure 1 Explained variance of objective HA benefit based on the significantly contributing independent variables. Note: Asterisks depict level of significance (**P<0.01; *P<0.05). Abbreviations: BEHL, better ear hearing loss; HA, hearing aid; LPS-4, Leistungsprüfungssystem subtest 4; SS, sentence span. Model I revealed that the outcome from the LPS-4 accounted for 25% of the variance in the benefit for speech in a quiet environment. None of the other predictor variables significantly contributed to the model. Regarding the benefit for speech in steady-state noise, 19% of the variance could be explained with the outcome of the LPS-4. For the benefit in terms of speech recognition in fluctuating noise, both the outcome from the LPS-4 and the SS task significantly contributed to the model and accounted for 26% of the variance in total. With the LPS-4 as the explanatory variable, regression coefficients were −0.525 (quiet), −0.472 (steady-state noise), and −0.358 (fluctuating noise). With the SS test, the regression coefficient was −0.355 (fluctuating noise). The age of the participant did not significantly contribute to any of the models. 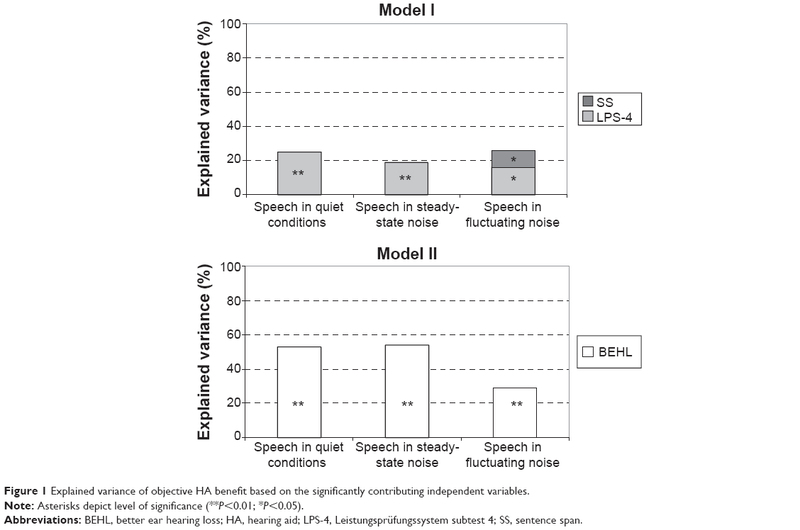 Model II revealed that BEHL was the only significant contributor to all outcome measures of benefit for the speech tests and accounted for 29%–54% of the variance in the data. Regression coefficients were 0.740 (quiet), 0746 (steady-state noise), and 0.565 (fluctuating noise). The significant contribution of the outcome from the LPS-4 with Model I disappeared when a measure for hearing loss was considered as an explanatory variable. This could be due to the fact that the number of participants was marginal with respect to additional small effects, or that explanatory variables are interrelated. Since age, cognitive function, and hearing loss might be connected with each another, a bivariate correlation of the most strongly contributing independent variables of Models I and II (ie, LPS-4 and BEHL) was calculated. A correlation coefficient of r=−0.57 (P=0.001) emerged. Thus, greater average hearing loss was associated with lower values in the LPS-4. As both the amount of hearing loss and the decline in cognitive functions are related to age, a partial correlation between the two variables was additionally calculated, controlling for the age of the participant. A partial correlation coefficient of r=−0.55 (P=0.002) emerged, indicating that the association of hearing loss and outcome from the LPS-4 was fairly independent of the age of the individual. Calculating similar models as described above for the overall outcome of the IOI-HA (mean across all items) did not yield a significant contribution from any of the predictor variables. Thus, subjective HA outcome could not be explained based on any of the measures considered in the present study. This study assessed the objective and subjective HA benefit (ie, the improvement related to the unaided condition) in older hearing-impaired persons and examined their possible relationship with various individual cognitive abilities. It extends the findings of other investigations that typically determine aided or unaided performance (but not necessarily benefit) and relate them to cognitive capacity (predominantly WM). Moreover, the present study has an explicit clinical focus, applying clinical outcome protocols and including a variety of modern HAs instead of addressing the effects of manipulating a specific signal-processing feature in a single HA type. The results revealed that the participants obtained a significant benefit from their HAs, as assessed by most of the objective measures. Speech in quiet conditions was improved by about 20%–25%. In fluctuating noise, speech reception thresholds were on average about 2.5 dB better in the aided than in the unaided condition. Obviously, HAs improved the audibility of the speech signal and helped to extract speech information in the short pauses of the fluctuating masker. This is typically referred to as ‘glimpsing’ or ‘dip listening’.37 In contrast, the HA benefit for the condition with steady-state noise was significantly smaller. This is due to the fact that dip listening is not possible and audibility of the speech signal can only be improved when the speech signal exceeds the noise (ie, positive SNR). Since some of the participants revealed negative SNRs for both performance levels in the unaided condition, amplification could not always be effective. The subjective benefit experienced in everyday life was assessed using the widely used IOI-HA. Comparing the results of the present study with data from the literature38–41 revealed fairly similar outcomes for all dimensions and confirmed the success of HA provision on a subjective level. Thus, the subjective benefit estimation of our participants might be regarded as typical for the population of HA users with mild-to-moderate hearing loss. In order to identify possible relationships between the cognitive abilities of the users and the benefit of HAs, different models were calculated, including the outcome of the neuropsychological tests as well as age and hearing loss as independent variables. Model I considered age and the outcome of the neuropsychological tests as potential explanatory variables for the objective benefit measures. The outcome of the LPS-4 that addresses fluid intelligence significantly contributed to the predictions of the benefit for speech intelligibility in all of the three conditions. Furthermore, the outcome of the SS test made a marginal but statistically significant contribution to the model of HA benefit for speech against the fluctuation masker. Regression coefficients were negative in all cases; that is, contrary to the hypothesis, a greater benefit was associated with a worse outcome from the two neuropsychological tests. However, despite the statistical significance of the results, the amount of variance explained for the benefit measures was rather small. When hearing loss was considered as an additional explanatory variable, the models for benefit changed. With BEHL, a substantial amount of variance of up to 54% could be explained and the contribution of the cognitive measures became nonsignificant when the measure for hearing loss was considered with the model. Regression coefficients were positive; hence, a greater benefit was associated with greater hearing loss. When hearing loss was related to the outcome of the LPS-4 that contributed most strongly to Model I, a significant negative correlation was found. This correlation held when age was considered as a confounding variable. Thus, participants with greater hearing impairment revealed a smaller cognitive capacity (as measured with the LPS-4) regardless of their age, and the statistically significant but moderate contribution of cognitive measures to Model I can at least to some extent be explained by its association with hearing loss. Interestingly, this explanation does not apply for the significant negative regression of the SS test outcome with HA benefit in fluctuating noise. The observation that lower WM capacity was associated with greater benefit might indicate release from cognitive load with amplification, but deserves closer examination. In light of these findings, it can be argued that cognitive capacity – addressed with basic neuropsychological measurements associated with speech perception – does not seem to have a clinically relevant impact on HA benefit when a typical elderly population with various types of modern HAs as well as typical benefit measures are taken into account. In contrast, hearing loss is a significant predictor of objective HA benefit, and is in turn correlated with cognitive capacity. This is in line with emerging evidence that there might be a causal relationship between sensory deprivation (as captured here with a simple auditory threshold measure) and cognitive decline. For instance, Lin et al42 found that rates of cognitive decline and the risk for incident cognitive impairment were linearly related to the severity of an individual’s baseline hearing loss. These findings were confirmed in another large-scale study43 and allowed the authors to suggest that hearing impairment may be a marker for cognitive dysfunction in older adults. It was also estimated that a reduction in cognitive performance associated with a 25 dB hearing loss was equivalent to a reduction associated with a 7-year age difference.44 Humes et al45 found evidence that age-related changes in cognitive performance may be mediated by age-related changes in sensory processing. This would speak well for a possible causal relationship between auditory deprivation and cognitive decline. Our findings seem to stand in contrast to several studies that show a relationship between cognitive performance and listening performance with, or a relative benefit from, different signal-processing strategies in HAs.15–19 As pointed out in the introduction, these observations have not been made uniformly. However, many studies give clues that there is a trade-off between the benefit from and artifacts with HA signal processing, and that this trade-off is associated with the cognitive abilities of the user. Importantly, these studies either applied acute experiments or the acclimatization time for the participants was rather short, with a maximum of 10 weeks listening experience in the specific HA setting. In our study, the HA wearers had more experience with their devices. Thus, listening experience with hearing technology might mediate the interplay of cognitive abilities and HA outcome. This argument was already made by Rudner et al46 who examined the ‘mismatch effect’ predicted by the Ease of Language Understanding (ELU) model47 and speculated that cognitive capacity played a role in speech recognition with different compression settings before a 9-week experience period – but not after that. This might be confirmed with the results of the present study. Moreover, our results are in agreement with Kalluri and Humes,11 who distinguish between short- and long-term interactions of hearing technology and cognition in older adults. They reported that, while many studies show such interactions with HA experience of typically less than about 2 months (‘short-term’), examinations considering long-term HA usage are still lacking. The present study may contribute to help filling this gap. Besides the objective HA benefit with regard to speech understanding in quiet and noisy conditions, the subjective benefit was assessed using the IOI-HA inventory. Ng et al48 examined relationships between self-reported HA outcome and different cognitive measures closely related to verbal information processing. The outcome of their cognitive tests addressing the quality of phonological representations and the speed of lexical access were moderately but significantly related to some of the IOI-HA domains in such a way that individuals with better cognitive skills reported more frequent daily HA use and better success with HAs. In contrast, no associations between cognitive skills and the overall outcome of the IOI-HA were found in the present study. Hence, our approach of determining more global cognitive skills might have been less specific than in the Ng et al study. Moreover, considering hearing loss as an explanatory variable also did not show any significant association with subjective HA benefit in the present study. Thus, determining variables explaining HA outcome in real life might be an important future research issue. Taken together, we did not find evidence for a negative relationship between cognitive abilities and subjective or objective HA benefit in a typical sample of older hearing-impaired persons. As stated above, five of the participants had suspected MCI. This figure is not unusual given the prevalence of MCI in older adults.14 When looking at their outcomes in the neuropsychological tests, they typically performed worse than those participants who showed unobtrusive results with the DemTect. However, we did not find any evidence that they received less objective or subjective benefit from their HAs than their peers with age-appropriate cognitive abilities. Thus, we conclude that cognitive capacity (in the range as assessed in the present study) is not in general a limiting factor in terms of the effectiveness of HA provision. In contrast, given the possible causal relationship of hearing deprivation and cognitive decline and the many positive effects of amplification,49,50 it seems appropriate to strongly advise HA use to counter age-related hearing loss. Similar conclusions were drawn for cochlear implantation, when older persons with severe-to-profound hearing loss were taken into account.51,52 Nevertheless, cognitive abilities might be important during the initial process of HA provision with regard to acclimatization effects and the individualization of HA and signal processing choice. This research was supported by the Marga-und-Walter Boll Foundation (Reference 210-08-11). Zhan W, Cruickshanks KJ, Klein BE, et al. Generational differences in the prevalence of hearing impairment in older adults. Am J Epidemiol. 2010;171(2):260–266. Popelka MM, Cruickshanks KJ, Wiley TL, Tweed TS, Klein BE, Klein R. Low prevalence of hearing aid use among older adults with hearing loss: the Epidemiology of Hearing Loss study. J Am Geriatr Soc. 1998;46(9):1075–1078. Davis A. Population study of the ability to benefit from amplification and the provision of a hearing aid in 55–74-year-old first-time hearing aid users. Int J Audiol. 2003;42 Suppl:2S39–2S52. Duijvestijn JA, Anteunis LJ, Hoek CJ, Van Den Brink RH, Chenault MN, Manni JJ. Help-seeking behaviour of hearing-impaired persons aged > or =55 years; effect of complaints, significant others and hearing aid image. Acta Otolaryngol. 2003;123(7):846–850. Knudsen LV, Oberg M, Nielsen C, Naylor G, Kramer SE. Factors influencing help seeking, hearing aid uptake, hearing aid use and satisfaction with hearing aids: a review of the literature. Trends Amplif. 2010;14(3):127–154. Kiessling J, Pichora-Fuller MK, Gatehouse S, et al. Candidature for and delivery of audiological services: special needs of older people. Int J Audiol. 2003;42 Suppl 2:2S92–2S101. Meister H, von Wedel H. Demands on hearing aid features – special signal processing for elderly users? Int J Audiol. 2003;42 Suppl 2:2S58–2S62. Pichora-Fuller MK, Singh G. Effects of age on auditory and cognitive processing: implications for hearing aid fitting and audiologic rehabilitation. Trends Amplif. 2006;10(1):29–59. Salthouse TA. Selective review of cognitive aging. J Int Neuropsychol Soc. 2010;16(5):754–760. Gordon C, Martin DJ. Mild cognitive impairment. Expert Rev Neurother. 2013;13(11):1247–1261. Plassman BL, Langa KM, Fisher GG, et al. Prevalence of cognitive impairment without dementia in the United States. Ann Intern Med. 2008;148(6):427–434. Gatehouse S, Naylor G, Elberling C. Benefits from hearing aids in relation to the interaction between the user and the environment. Int J Audiol. 2003;42 Suppl 1:S77–S85. Lunner T, Sundewall-Thorén E. Interactions between cognition, compression, and listening conditions: effects on speech-in-noise performance in a two-channel hearing aid. J Am Acad Audiol. 2007;18(7):604–617. Foo C, Rudner M, Rönnberg J, Lunner T. Recognition of speech in noise with new hearing instrument compression release settings requires explicit cognitive storage and processing capacity. J Am Acad Audiol. 2007;18(7):618–631. Ng EH, Rudner M, Lunner T, Pedersen MS, Rönnberg J. Effects of noise and working memory capacity on memory processing of speech for hearing-aid users. Int J Audiol. 2013;52(7):433–441. Arehart KH, Souza P, Baca R, Kates JM. Working memory, age, and hearing loss: susceptibility to hearing aid distortion. Ear Hear. 2013;34(3):251–260. Cox RM, Xu J. Short and long compression release times: speech understanding, real-world preferences, and association with cognitive ability. J Am Acad Audiol. 2010;21(2):121–138. Neher T, Grimm G, Hohmann V, Kollmeier B. Do hearing loss and cognitive function modulate benefit from different binaural noise-reduction settings? Ear Hear. 2014;35(3):e52–e62. Kessler J, Calabrese P, Kalbe E, Berger F. Ein neues Screening-Verfahren zur Unterstützung der Demenzdiagnostik [DemTect: a new screening instrument to support the diagnosis of dementia]. Psycho. 2000;26:243–347. German. Hahlbrock KH. [Speech audiometry and new word-tests]. Über Sprachaudiometrie und neue Wörterteste. Arch Ohren Nasen Kehlkopfheilkd. 1953;162(5):394–431. German. Wagener K, Kühnel V, Kollmeier B. Entwicklung und Evaluation eines Satztests in deutscher Sprache I: Design des Oldenburger Satztests [Development and evaluation of a German sentence test – Part I: Design of the Oldenburg sentence test]. Z Audiol. 1999;38(1):4–15. German. Brand T, Kollmeier B. Efficient adaptive procedures for threshold and concurrent slope estimates for psychophysics and speech intelligibility tests. J Acoust Soc Am. 2002;111(6):2801–2810. Dreschler WA, Verschuure H, Ludvigsen C, Westermann S. ICRA noises: artificial noise signals with speech-like spectral and temporal properties for hearing instrument assessment. International Collegium for Rehabilitative Audiology. Audiology. 2001;40(3):148–157. Cox RM, Alexander GC. The International Outcome Inventory for Hearing Aids (IOI-HA): psychometric properties of the English version. Int J Audiol. 2002;41(1):30–35. Lehrl S. Mehrfachwahl-Wortschatz-Intelligenztest MWTB. Balingen, Germany: Spitta Verlag; 2005. Horn W. LPS Leistungspruefsystem. 2nd ed. Goettingen, Germany: Hogrefe; 1983. Helmstaedter C, Lendt M, Lux S. Verbaler Lern und Merkfaehigkeitstest. Goettingen, Germany: Hogrefe; 2001. Lewandowsky S, Oberauer K, Yang LX, Ecker UK. A working memory test battery for MATLAB. Behav Res Methods. 2010;42(2):571–585. Daneman M, Carpenter PA. Individual differences in working memory and reading. Journal of Verbal Learning & Verbal Behavior. 1980;19:450–466. Brickenkamp R. Aufmerksamkeits-Belastungs-Test (Test d2). In: The d2 Test of Attention. Goettingen, Germany: Hogrefe; 1962. Oswald WD, Roth E. Der Zahlen-Verbindungs-Test (ZVT). Ein sprachfreier Intelligenz-Test zur Messung der “kognitiven Leistungsgeschwindigkeit” Handanweisung (2., überarbeitete und erweiterte Auflage). Göttingen, Germany: Hogrefe; 1987. Cooke M. A glimpsing model of speech perception in noise. J Acoust Soc Am. 2006;119(3):1562–1573. Kramer SE, Goverts ST, Dreschler WA, Boymans M, Festen JM. International Outcome Inventory for Hearing Aids (IOI-HA): results from The Netherlands. Int J Audiol. 2002;41(1):36–41. Cox RM, Alexander GC, Beyer CM. Norms for the international outcome inventory for hearing aids. J Am Acad Audiol. 2003;14(8):403–413. Heuermann H, Kinkel M, Tchorz J. Comparison of psychometric properties of the International Outcome Inventory for Hearing Aids (IOI-HA) in various studies. Int J Audiol. 2005;44(2):102–109. Smith SL, Noe CM, Alexander GC. Evaluation of the International Outcome Inventory for Hearing Aids in a veteran sample. J Am Acad Audiol. 2009;20(6):374–380. Lin FR, Yaffe K, Xia J, et al; Health ABC Study Group. Hearing loss and cognitive decline in older adults. JAMA Intern Med. 2013;173(4):293–299. Gurgel RK, Ward PD, Schwartz S, Norton MC, Foster NL, Tschanz JT. Relationship of hearing loss and dementia: a prospective, population-based study. Otol Neurotol. 2014;35(5):775–781. Lin FR. Hearing loss and cognition among older adults in the United States. J Gerontol A Biol Sci Med Sci. 2011;66(10):1131–1136. Humes LE, Busey TA, Craig J, Kewley-Port D. Are age-related changes in cognitive function driven by age-related changes in sensory processing? Attent Percept Psychophys. 2013;75(3):508–524. Rudner M, Foo C, Rönnberg J, Lunner T. Cognition and aided speech recognition in noise: specific role for cognitive factors following nine-week experience with adjusted compression settings in hearing aids. Scand J Psychol. 2009;50(5):405–418. Rönnberg J. Cognition in the hearing impaired and deaf as a bridge between signal and dialogue: a framework and a model. Int J Audiol. 2003;42 Suppl 1:S68–S76. Ng EH, Rudner M, Lunner T, Rönnberg J. Relationships between self-report and cognitive measures of hearing aid outcome. Speech Lang Hear. 2013;16(4):197–207. Ciorba A, Bianchini C, Pelucchi S, Pastore A. The impact of hearing loss on the quality of life of elderly adults. Clin Interv Aging. 2012;7:159–163. Holden LK, Finley CC, Firszt JB, et al. Factors affecting open-set word recognition in adults with cochlear implants. Ear Hear. 2013;34(3):342–360. Lachowska M, Pastuszka A, Glinka P, Niemczyk K. Is cochlear implantation a good treatment method for profoundly deafened elderly? Clin Interv Aging. 2013;8:1339–1346.